Located in a cozy residential area in Tofte, MN. Parkview is a quaint 3 bedroom, 2 bathroom vacation rental home in Tofte, MN. Located in a residential, parklike setting, Parkview is like coming home to a place you`ve known and loved for a lifetime. The large spacious backyard and mature trees give you lots of room to roam but also privacy. 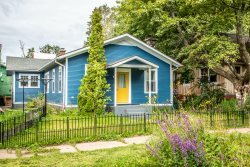 Located just across the street from Tofte Park and Lake Superior- this is a great location for families. Enter this adorable home and walk into the living room area. With plenty of seating for the whole group and lots of unique touches, this living room feels like home. The living room opens into a formal dining room area which is perfect for a meal or for board game night. Large windows let in the natural light and make this room feel light and airy. Enjoy the comfy recliners as you gather in the living room at night. Two of the great touches that make this house more homey are the organ and wood burning fireplace. Seating for 6 around the dining room table make it a great spot to hang out. The large eat-in kitchen has everything you need to prepare a home cooked meal during your stay. Dishwasher included. No need to hand wash on your vacation here. The kitchen is large enough for more than one chef to cook at a time. Another fun bonus to this home is the bright porch area. Walk through the sliding glass doors of the porch area and onto the home`s spacious yard. The master bedroom, known as the Pink Room, is spacious and has a queen sized bed and tons of natural light. The attached bathroom to the master bedroom has a walk-in shower. The second bedroom, known as the Yellow Room, has a queen sized bed and plenty of room to unpack and relax. The third bedroom, the Blue Room, has a double bed and bonus TV. The guest bathroom has a shower/tub combo. Coming for an extended stay Do your laundry in the laundry room off of the kitchen. Call this beautiful residential house your home during your next stay on the North Shore. When you see this sign you`ll know you`re home. Parkview is a cute, quaint home with many unique and homey touches. During the warmer months you can enjoy a meal outside, either in the spacious yard or in Tofte Park. Tofte Park is just a short stroll away and features BBQ grills and Lake Superior access. Great family place! This single story, country style home, overlooking Lake Superior and Tofte Park, has 3 bedrooms and 2 bathrooms, plus large front and back yards. Located in a comfortable residential setting, this vintage decorated home gives the feel of visiting Grandma's house for the weekend or getting away to a family home you've known for years. You will immediately feel right at home here. There is a formal dining room with a china hutch and spacious eat-in kitchen. The living room has a Lake Superior view and wood burning fireplace. Other amenities include an organ and a 3-season screen porch. Tofte Park, a little-known treasure, has picnic tables, large fire ring, pavilion, Gitchi Gami bike trail access, boat ramp, and large lake side BBQ grill. Kids absolutely love this park. Also great for a group of adults here for a weekend of Gin Rummy and fine wine. The town of Tofte is a great home base for many North Shore adventures. In the summer months you are just a short drive away from miles of hiking and biking trails including the Gitchi Gami bike trail and Temperance River State Park, plus just 10 minutes from the Superior National at Lutsen Golf Course. Head inland to the Carlton Peak area in the fall season to take in the beauty of leaf change season on the North Shore. In the winter months you are just a 10 mile drive from the Lutsen Mountains Ski Area (also a great summer destination with an alpine slide and sightseeing gondola) and have easy access to miles of snowmobile trails (plus plenty of room for a trailer). In the spring, a short drive to any of the area state parks will bring you to amazing waterfalls that truly come to life during the "waterfall season" every spring. Looking for more adventures? Visit Sawtooth Outfitters for ideas of where to go, what to do, and to rent the gear you need to do it- you're within easy walking distance! If you are craving a bite to eat take a short stroll to the Bluefin Grill or CoHo Cafe. Many other dining options are just a short drive up the shore in Lutsen. Take a day trip up to Grand Marais, 30 miles up the shore, for a day of shopping and dining at this quaint lakeside town. Of course, you can always stay at home and relax in or out with a good book and good friends. Whatever your reasons for visiting the North Shore, Parkview is here to be your home base! Please note: the TV is for VCR/DVD only. The lake access is across a service road. I loved the home. It was reasonably quiet, had nice amenities and a great view of the lake!